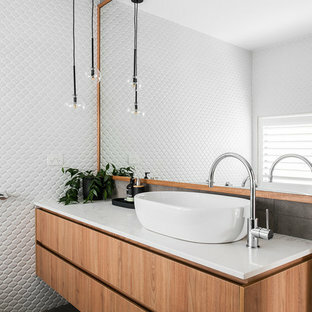 This is an example of a small contemporary 3/4 bathroom in Melbourne with beige cabinets, porcelain tile, white walls, solid surface benchtops, flat-panel cabinets, a curbless shower and an integrated sink. 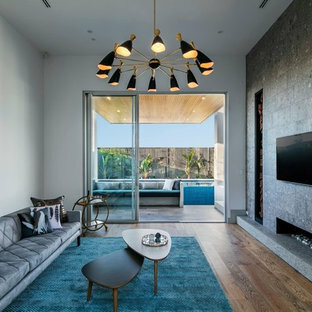 This is an example of a mid-sized contemporary formal open concept living room in Adelaide with grey walls, dark hardwood floors, a wall-mounted tv, a ribbon fireplace, a tile fireplace surround and brown floor. 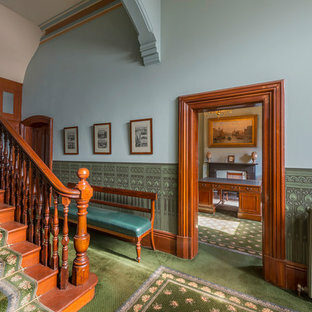 This is an example of a traditional foyer in Melbourne with blue walls and carpet. Design ideas for a contemporary bathroom in Sunshine Coast with flat-panel cabinets, grey cabinets, a freestanding tub, beige tile, black tile, brown tile, gray tile, a drop-in sink, wood benchtops and grey floor. 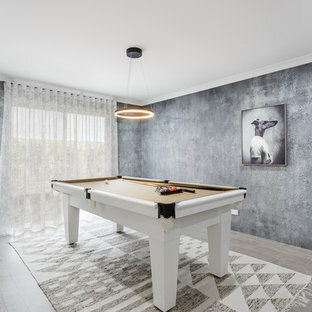 Mid-sized contemporary open concept family room in Perth with a game room, grey walls, ceramic floors and grey floor. 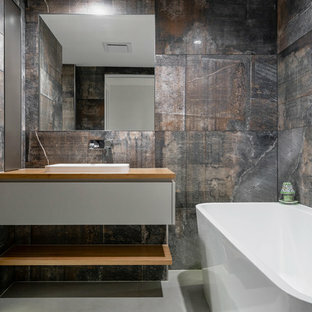 Photo of a mid-sized industrial bathroom in Brisbane with open cabinets, a two-piece toilet, concrete floors, a vessel sink and wood benchtops. 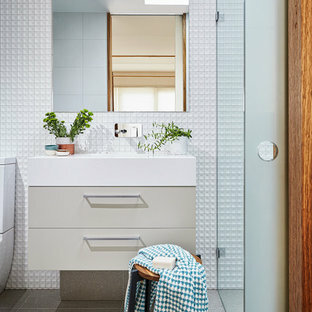 This is an example of a contemporary bathroom in Hobart with flat-panel cabinets, medium wood cabinets, white walls, a vessel sink and grey floor. 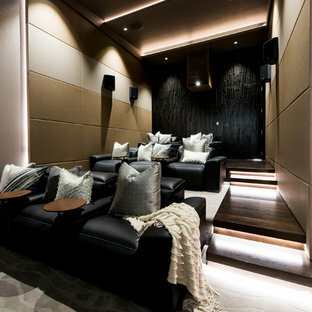 This is an example of a large contemporary enclosed home theatre in Sunshine Coast with beige walls, carpet and beige floor. Photo of a contemporary study room in Dallas with dark hardwood floors and a freestanding desk. Inspiration for an expansive contemporary formal open concept living room in Miami with porcelain floors, no fireplace, no tv and grey floor. Design ideas for a large beach style open concept living room in Dallas with dark hardwood floors, white walls, a standard fireplace, a wood fireplace surround, a concealed tv and brown floor. 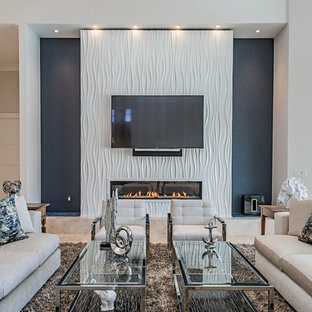 This is an example of a contemporary open concept family room in Orange County with white walls, a ribbon fireplace, a metal fireplace surround, a wall-mounted tv and beige floor. 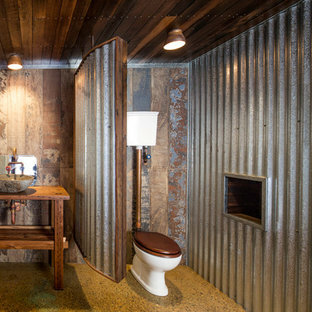 Contemporary powder room in Santa Barbara with open cabinets, a one-piece toilet, grey walls, concrete floors, a vessel sink, solid surface benchtops and grey floor. Country formal open concept living room in Denver with grey walls, a two-sided fireplace and no tv. Design ideas for a mid-sized modern powder room in Chicago with gray tile, porcelain tile, grey walls, light hardwood floors and an integrated sink. Large country master bedroom in Other with carpet, grey floor, multi-coloured walls and no fireplace. Inspiration for a contemporary hallway in Vancouver with white walls and light hardwood floors.